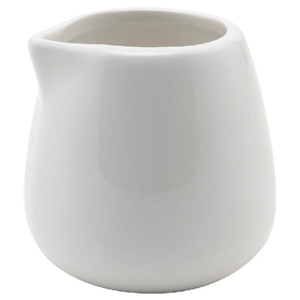 The Royal Genware Traditional Cream Jug provides a classic look for serving milk, cream or side sauces at the table. With Royal Genware Fine China, these milk tots offer a truly exceptional premium quality. With these milk jugs, your afternoon tea has that extra elegant edge. The durable, versatile design ensures this china jug can also be used for serving your favourite sauce alongside a juicy steak. "Got these for milk with teas and coffees and they are great for a portion and look really cute, would be great for afternoon teas." "I have always liked these little jugs when shown on Master Chef and during a mammoth search on the Web, I was so happy to find them on Drinkstuff. They fit the hand particularly well!"